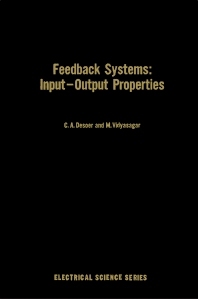 Feedback Systems: Input-output Properties deals with the basic input-output properties of feedback systems. Emphasis is placed on multiinput-multioutput feedback systems made of distributed subsystems, particularly continuous-time systems. Topics range from memoryless nonlinearities to linear systems, the small gain theorem, and passivity. Norms and general theorems are also considered. This book is comprised of six chapters and begins with an overview of a few simple facts about feedback systems and simple examples of nonlinear systems that illustrate the important distinction between the questions of existence, uniqueness, continuous dependence, and boundedness with respect to bounded input and output. The next chapter describes a number of useful properties of norms and induced norms and of normed spaces. Several theorems are then presented, along with the main results concerning linear systems. These results are used to illustrate the applications of the small gain theorem to different classes of systems. The final chapter outlines the framework necessary to discuss passivity and demonstrate the applications of the passivity theorem. This monograph will be a useful resource for mathematically inclined engineers interested in feedback systems, as well as undergraduate engineering students.